​You may find the hearing loss checklist at the bottom of the page handy and it is printable. Otitis media is a general term referring to inflammation (fluid with or without infection) of the middle ear space. 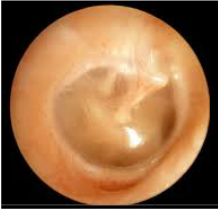 ​This is what a NORMAL eardrum looks like. NO infection or fluid in the middle ear is present. ​You can see the reflection of the Doctors ear torch shining back at you. COMMONLY known as an EAR INFECTION refers to an active infection in the middle ear with an inflamed eardrum, often with pain and fever. Acute otitis media occurs most often in children aged between 6 and 18 months, but is common up until 4 years of age. ​- May have frequent colds and runny nose. Refers to the presence of a hole in the eardrum with continuing discharge of pus from the middle ear over many weeks. If left un-treated this hole will not close itself naturally and will need to be surgically repaired - which is a painful operation. Pus draining from a perforated eardrum. 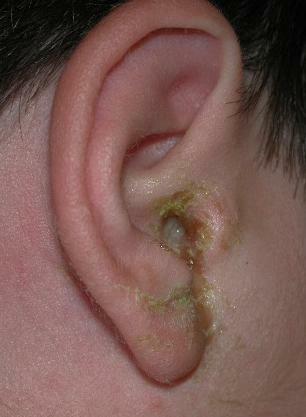 This ear pus contains Staph bacteria and is contagious. - If this pus has an odor it may have a severe infection and needs urgent medical treatment. This type of infection occurs in the ear canal and NOT the middle ear. 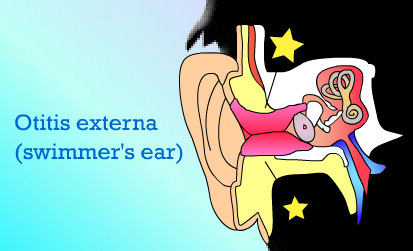 It is also known as Swimmers Ear and is more common in older children and adults. Water and bacteria entering the ear canal is a common cause. It is also very common in Tradesmen as they use and re-use dirty ear plugs. Otitis media with effusion is a common infection that normally occurs in children. Effusion is just another term for fluids. The eardrum is not red or inflamed and there is no pain or fever. Fluid in the middle ear can last many months. It can also be there one week and gone the next before returning again. This is why REGULAR hearing testing is so important. Some children take months to diagnose through hearing testing as the fluid may not be present by the time you get in for your long awaited appointment for hearing testing. THE EARDRUM WILL NOT VIBRATE NORMALLY WHEN A CHILD HAS FLUID IN THE MIDDLE EAR. *Your GP may diagnose glue ear but then it may not be present at the time of the hearing testing. Something even more confusing is children can have glue ear and they can still have normal hearing levels at times. Each time you visit the Dr ask to have your child's ears checked- even if you are there for something un-related to otitis media. You should try to make each school holidays your time to have your children's hearing tested. ​Below is a checklist we use in schools developed by the Department of Education Hearing Support Team in Dubbo. It helps to identify possible hearing problems. - there are no physical medical symptoms of EFFUSION/GLUE EAR.